Step In Time Dance School was established in 2007 and provides group and individual, social Ballroom and Latin American dancing instruction. We provide a friendy, secluded learning environment where everyone can learn at their own pace. For those interested in completing dancing certificate exams we provide a carefully constructed syllabus, with members taking their exams in a structured step by step process from Beginner to Gold. We specialise in courses for wedding couples providing a personalised dance, choreographed by us for your wedding, to music of your choice. We are also happy to do specific short term dance courses for other requirements such as Matric Dances, special birthdays etc. Step In Time also gives Life Orientation courses at schools, providing learners from Grades 10 to 12 with a dancing course in 2 dances. They then receive a certificate for inclusion in their Life Orientation Portfolio! Regular social gatherings are held at the studio to enable all members of Step In Time Dancing School to meet each other and interact socially. 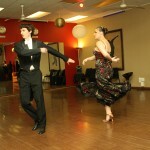 These gathering are great fun and provide opportunities for everyone to dance. 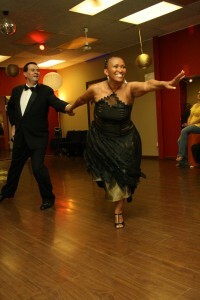 Dancing is a great form of exercise and suitable for all ages. Bring your friends, make up a group and do things together!